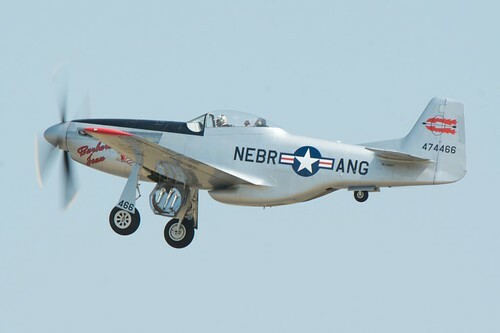 AirExpo 2012 – P-51D Mustang, originally uploaded by pmarkham. I attended the Wings of the North AirExpo 2012 a few weeks back and one of the aircraft performing was a P-51D Mustang named Barbara Jean. I snapped a few decent pictures of it and this one is my favorite. I managed to catch the landing gear just as it was beginning to retract. If you look closely, the guy in the rear seat is doing a video of the takeoff. It was a difficult day for photography. It was HOT and HAZY all day.